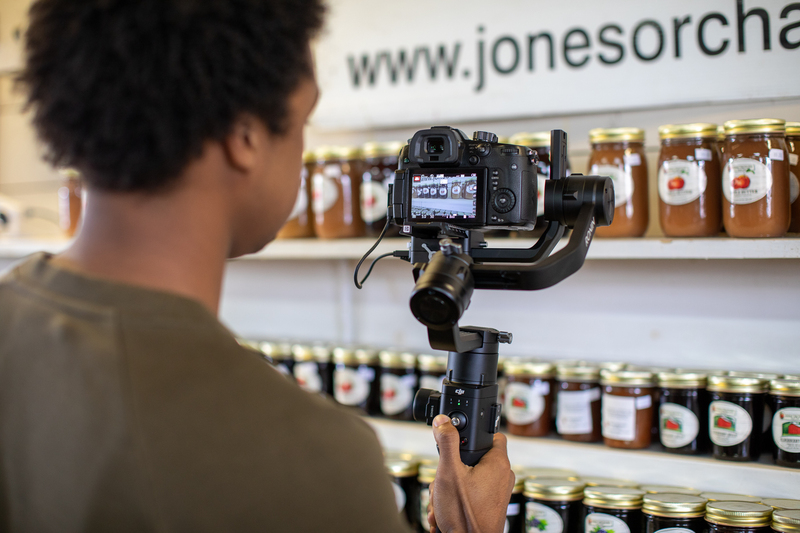 We’re past the point of, “they’re all the rage.” Compact brushless gimbals and other types of affordable DSLR stabilizers have become staples for wedding videographers, music video shooters, and vloggers. Nearly forty years of innovation that started with the Steadicam, a pricey and complicated precision camera stabilization system that requires specialized training for operators, has developed into manageable and economic dynamic movement devices that can be learned and even mastered in a matter of hours, depending on one’s commitment. The stabilizer space has grown increasingly niche and each niche has become increasingly crowded over the past few years. A handful of manufacturers have managed to make their developments stand out by way of a willingness to listen to the market and improve or adapt features as needed. DJI is one of those manufacturers and they’ve been making vast improvements in their product quality and support. The newest addition to DJI’s professional gimbal line, the DJI Ronin-S, was met with plenty of fanfare from eager operators who got to experience the prototype at CES and NAB this year. When our first Ronin-S shipment made it to Lensrentals.com, I wasted no time calling dibs on a weekend rental. 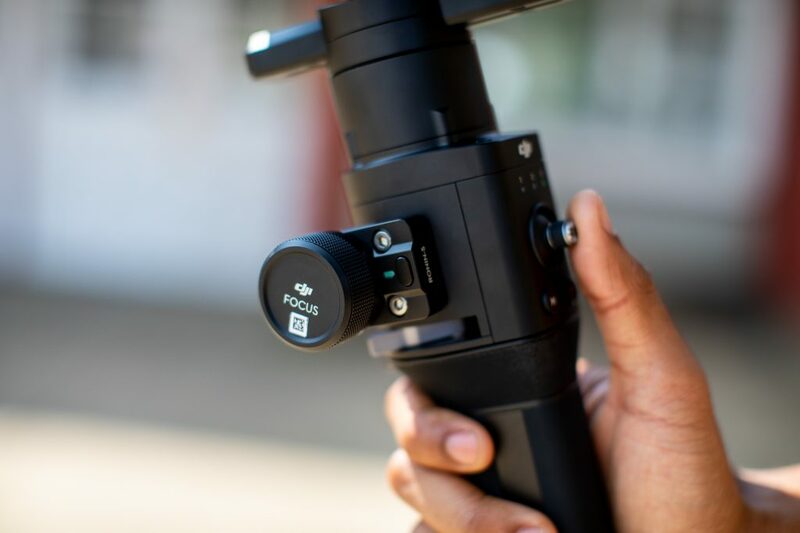 Engineered like a miniature DJI Ronin 2 with a beefed up DJI Osmo form factor, DJI has effectively bridged their prosumer and professional lines in a highly anticipated and even more ambitious release. This fledgling product is barely out of it beta stage but promises the control we’ve come to expect from the Ronin line, without the physical restraints that come along with traditional brushless gimbal operation. Here’s a recap of what stood out to me during my time with the Ronin-S. The design of the gimbal is unique and features a quasi-dual vertical axis. This “half axis” as I lovingly call it, gives the operator more creative control but requires an, albeit negligible, additional step for balancing. Similar stabilizers advertise an operator’s ability to balance within a matter of seconds. The first time I set up the Zhiyun-Tech Crane-2, it took me roughly 35 seconds to achieve perfect balance, without referring to the manual. Balancing the Ronin-S took me just over one minute and demanded at least one reference to the manual before I got a perfect score for all axes from the app. I pride myself on being well versed in gimbal operation but what I lost in seconds and ego, I realized I gained in the form of eradicating a major DSLR stabilizer drawback. One of the biggest challenges I’ve experienced with compact DSLR stabilizers with a similar form factor is that while they may be easy to balance, weight distribution changes like subtle zoom pushes can cause the balance to become offset. With an on-the-go-type target audience, zoom lenses are a must for many shooters in this space. Don’t get me wrong, this is a user wishlist feature, not a flaw with single-grip gimbals. Stabilizers are designed to move a camera smoothly based on an established center of gravity. The precise mechanics needed to also account for a heavy, horizontal telescoping apparatus, like a zoom lens, qualifies as next level engineering. The Ronin-S, however, may be just that. I found it to be more adept at handling modest changes in the camera cage’s weight distribution than competitor’s stabilizers. DJI went so far as to offer a motor pause feature, allowing you to briefly disengage the motors long enough to swap between comparably sized lenses. Once the motor pause is released and the motors are again engaged, a quick tap of the recenter button orients your horizon line again. I really wanted the Ronin-S to have an onboard monitoring/menu interface system. I really didn’t want to download yet another app on my phone with an unmatched app support to product lifecycle; an app whose support will likely be terminated when the manufacturer shifts its focus to an exciting new release, regardless of whether or not the product I downloaded the app for in the first place is still relevant and/or viable. Unfortunately, the Ronin-S lacks this feature and relies on a free app as the operator’s interface. This wasn’t a deal breaker for me and really shouldn’t be for anyone. Almost all gimbals that feature LCDs, still require an app to take full advantage of the available features. Fortunately, DJI has ditched their older, buggy assistant app and incorporated Ronin-S support into the newest gimbal app that debuted with the Ronin 2 last year. 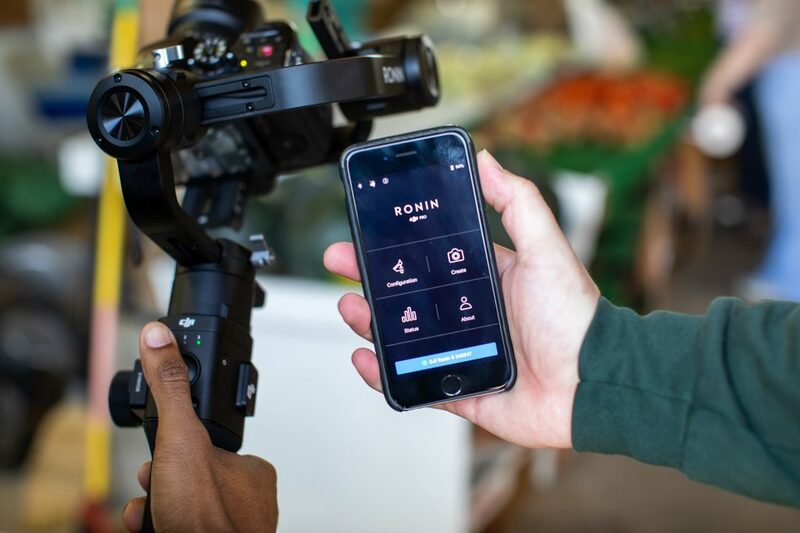 Navigating the app isn’t as intuitive as some newcomers will hope to find but the Ronin-S’ available user profile customization options mean that even a first time user with an hour or two of dedicated prep time can leave the smart device behind and enjoy beautiful smooth shots and quick transitions in the field. But the app does a lot of things right as well. For one, the pairing aspect is incredibly quick and easy. Bluetooth can sometimes be a real pain, connecting and disconnecting at will. In our experience, the connection process has been as simple as opening the app, selecting the Ronin-S that is in range, and they’re connected almost instantaneously. The connection was also reliable too, without any cutouts of controls just as long as the phone was within ~15 ft of the Ronin-S. We didn’t test the range and distance of the Bluetooth connection, but if my experience with Bluetooth speakers is any indication, we’d expect a signal falloff once you go beyond 25 feet or so. 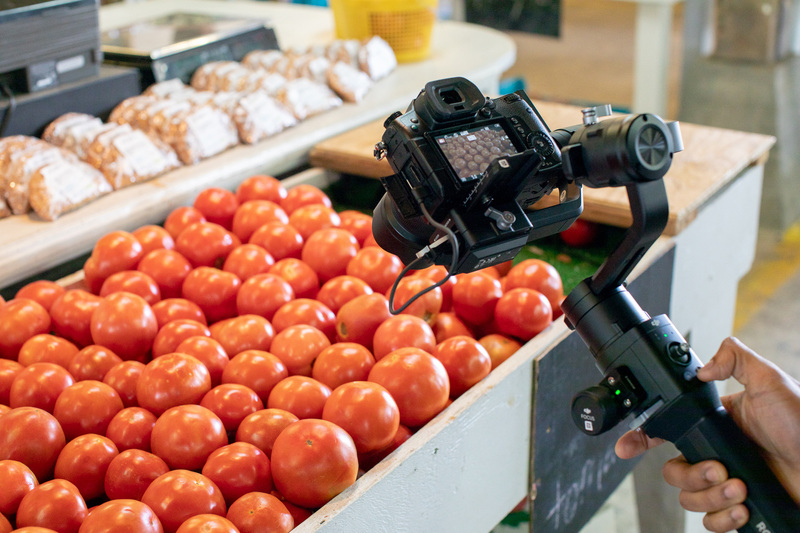 For shooters wanting to take advantage of creative features like motion lapse, panorama, or 360º roll (flashlight mode), you will probably need to stay tethered to your device in the field but the sturdy detachable tripod foot included with the Ronin-S makes it easy to put the gimbal down on a steady and flat surface while you configure the settings for your next amazing capture. 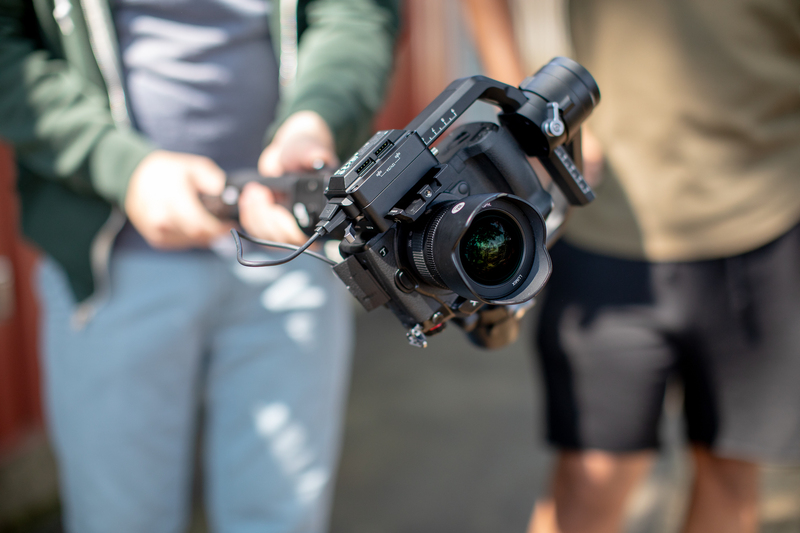 A fluid and ball head standard ¼-20 receiver on the Ronin-S base means you have the option to mount the compact stabilizer to any number of third-party supports when handheld operation isn’t necessary. Along with the app, the DJI Ronin is equipped with a few handy buttons and controls to use while operating the unit. With three dedicated buttons for Mode, Capture, and Record, the Ronin-S feels minimal, but really well designed. In particular, the onboard joystick feels great, especially when working with the app to finetune your controls and settings. You can individually control the function, sensitivity, and direction of each axis on the joystick, and save those settings as a profile for different operators and shooting scenarios. Record trigger and focus control, at least on compatible lenses, works about as well as can be expected. It’s never going to match the smoothness of a manual focus rack, but it’s good enough. However, we did run into a small problem with the hardware, which will hopefully be fixed in a firmware update soon. For some reason, the record trigger button is a little finicky. Occasionally, we had to press the record button 2 or 3 times before it engaged. I’ve since tested this against other copies of the unit, and it seems to be an issue inherent to the gimbal itself, and not a single item fluke. The Ronin-S is a great stabilizer but being a great stabilizer doesn’t make it the best option for all shoots. While the Ronin-S breaks down into a nice, compact case, the stabilizer itself isn’t much lighter than a camera cage gimbals like the Ronin-M. This isn’t a complaint against the Ronin-S but against the entire arena of higher capacity stabilizers that celebrate diminishing ergonomics. The single-hand-graspable stabilizer is marketed as a form of versatile creative freedom that doesn’t restrict your movement or camera choice, but it is not without its caveats. The manufacturers in this area have been getting away with some fairly grandiose mitigations of the physical demands needed to operate something like the Ronin-S. Arguably, they’re downright deluded. Fully loaded, the Ronin-S has the potential of weighing upwards of 12 lbs, which can quickly tire or even strain that singular wrist support of yours. Twelve pounds may not sound like much but over the course of a full production day, you’re either getting ripped or getting Carpal Tunnel Syndrome. Don’t believe me? Go to the grocery store and head to the dairy aisle. Grab a single gallon and a half gallon jug of milk. Grip both handles in your predominant hand and extend your respective arm straight out in front of you. If I had to wager, I’d bet your arm gets tired before that milk gets warm. Fortunately, DJI is a master of accessorization and I suspect solutions to this problem will be here soon enough. So why would anyone want to endure the fatigue associated with the weight of a single-grip stabilizer? 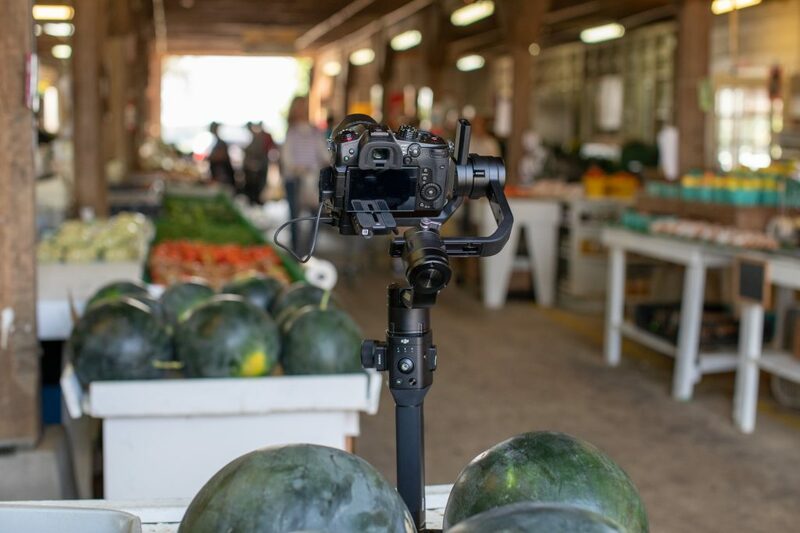 Simply put, there’s really no way to get around the weight factor if you want to use the camera package of your choice while maintaining the full range of creative options offered by a single-grip stabilizer like this. 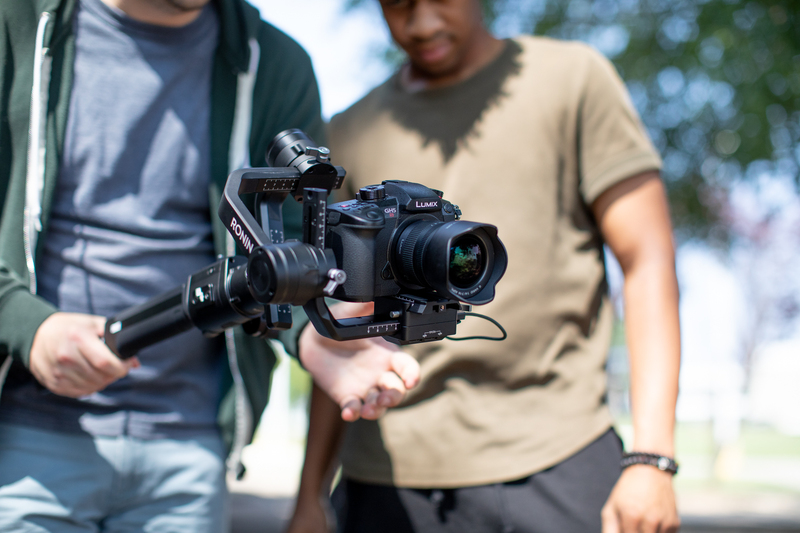 The Ronin-S’ overall response to movement behaves more like the high-priced Steadicam than a Ronin or traditional brushless gimbal, allowing the user to move quickly from upright to underslung modes in a rapid and nearly perfect, frictionless transition. The DJI Ronin-S meets nearly all the expectations you’d want for a gimbal system. The inherent design shortens the learning curve considerably and will make you feel like an expert in a matter of hours. Subtle movements have never been easier, and with the help of DJI’s tutorial videos, you’re able to get started on the unit quickly. The only concern we found with the unit was with the battery system, depending on your shooting style. DJI promises an impressive 12-hour battery life, but also built the battery into the handle of the unit, meaning the only way to hot-swap batteries is by buying a second handle. While this shouldn’t be a concern given the 12-hour battery life, we still haven’t done significant tests to support DJI’s claims. For a certain type of shooter, though, not being able to swap batteries on the fly could be a dealbreaker. 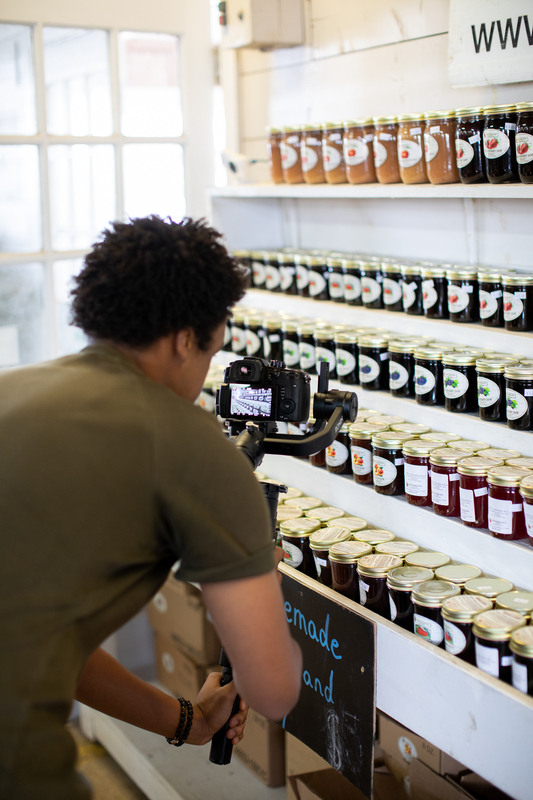 Below you’ll find some footage from a test we shot at the Agricenter Farmer’s Market at Shelby Farms in Memphis, Tennessee. Thanks to everyone there for their help and patience. If you’re in the area and want very good tomatoes or fried pies, check them out. We shot the test on a Panasonic GH5S with a Panasonic 7-14 f/4 lens. The footage was recorded in V-log and graded using a LUT from James Miller’s Deluts pack. As always, if you have any questions or observations, let us know in the comments. I was once a Freefly loyalist but DJI clearly doesn’t want to be the runner-up in the world of gimbal technology and their efforts to create better and more useful products are definitely winning me over. I predict the Ronin-S will be a welcome addition to many DSLR video shooters’ arsenals and DJI will continue to earn respect from people who were otherwise turned off by some early, less reliable products. In my time testing the Ronin-S, I was impressed with the ability of the motors to handle weight effortlessly and quietly but was disappointed that I was limited to the Panasonic GH5 or Panasonic GH5S and a short list of lenses to enjoy the control features like focus pulling. Fortunately, in the time I spent writing this, firmware updates have been released to accommodate a broader range of DSLR shooters. While still limited, Canon, Nikon, and Sony now have camera models with either some or all available features controllable by the Ronin-S. A complete list of camera control functions by model can be found here. Overall, I see tons of potential in both this product and this market and I’m excited to see how DJI graduates this little gimbal into full maturity. Articles written by the entire editorial and technical staff at LensRentals.com. These articles are for when there is more than one author for the entire post, and are written as a community effort. excellent review. Looking forward to the firmware updates & accessories. Especially if the gimbal can track a subject I select even if they leave frame. That would be nice since the 5DmkIV is exceptional in this realm. Also looking forward to rigging up my C300mkii. Saw a guy do a great tutorial the other day where he loaded up the RONIN-s and the C300mkii made the cut. Albeit he did have to add a back set of counterweights. Mine is arriving this week….. super stoked. Basicaly it would imply in some cases the rig locked on the subject just like subject locked-on AF. In such case camera would have to talk to the rig or be factory integrated package. I don`t know if DJI Osmo can pull the trick. With something handheld like this you pretty much don’t, at least not beyond in-camera IS. It’s all foot rolling and bent knees. We do have y-axis stabilization options for lager gimbals like the Ronin-2. The Readyrig is a common solution for that. How do you stabilise bounce? Great info. This is why I only rent from Lensrentals. You all are the best. Every shot was on the gimbal, no IS or post-production stabilization. For most of the shoot, Julian, our new Video Producer was operating while I ran the app. After initial setup, though, you only really need to get into the app occasionally, so a second operator just for that wouldn’t be essential. Experience-wise, I’ve operated just about every gimbal model we carry, but this shoot was Julian’s first time using one. I set it up initially and was around to help out, but it’s honestly relatively easy to pick up and use. I’d say, even for someone completely new to gimbals, a day or two of practice should be plenty. Mother of Dragons! Amazing video from your farmers’ market. And you really did all those shots with just the gimbal, no in-body image stabilization, no track dolly, no crane? How many people did you have operating? Was it one for the gimbal, one for the app? And how much prior experience with gimbals do the three of you have? Or to ask it another way, how many days, weeks, or months would I have to practice with a gimbal before I could achieve shots that are as nice as yours? I thought about a gimbal for my GH5 but decided to get a Crane-M for the RX100V instead once I looked at the weight I’d be carrying around one-handed (although they do make a 2-hand adaptor plus a remote control to attach to it). I think that’s my limit for anything other than short shots (740g+299g).